Study and treatment of a Renaissance altarpiece reveals new details about the artist’s working method, as well as his brilliant colors. Advances in imaging technology have revolutionized science and medicine—and today, they are also revolutionizing the study and conservation of art. New imaging techniques have made it possible for art conservators and conservation scientists to develop treatments for an artwork, and to unlock secrets beneath its surface, just by looking. Imaging techniques also allow specialists to travel back in time and hypothesize what an artist might have reconsidered and altered while painting—a “track changes” of sorts for art. These changes hidden beneath the paint layers are known as pentimenti, derived from the Italian pentirsi, which means to repent or change your mind. The technique known as infrared reflectography (IRR for short) is particularly useful for revealing such pentimenti. Because some pigments absorb infrared radiation and others reflect it, specialists can use the reflections from infrared light to create a map (a so-called reflectogram) of materials hidden from the naked eye. Infrared reflectography was a key technique in uncovering the creative process of Italian master Jacopo da Pontormo. Conservator Daniele Rossi recently used it to study and restore Pontormo’s Visitation, painted circa 1528–29. 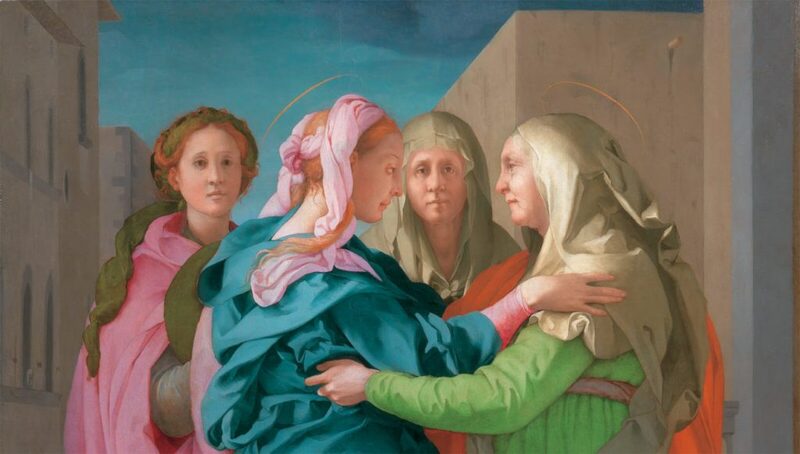 A masterpiece of Italian Renaissance painting, the Visitation anchors the international traveling exhibition Pontormo: Miraculous Encounters, co-curated by Davide Gasparotto, senior curator of paintings at the J. Paul Getty Museum, and Bruce Edelstein, coordinator for graduate programs and advanced research at New York University in Florence. A panel painting (oil on poplar wood), the Visitation depicts the meeting between the Virgin Mary and her aged cousin Saint Elizabeth, who are accompanied by attendants as they share news that they are both expecting sons. 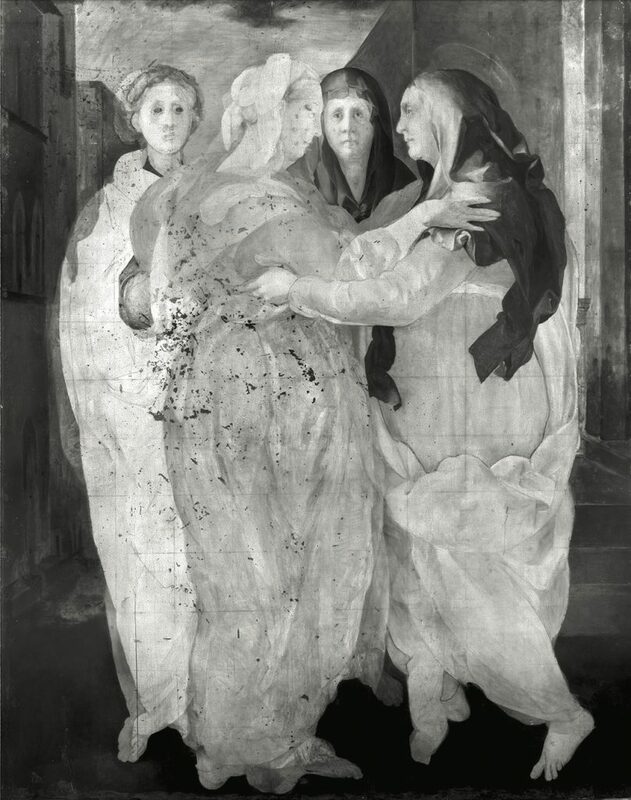 The exhibition reunites the Visitation, a loan from the Parish Church of Carmignano, Italy, with its modello (a study for a painting that is also a finished drawing) from the Gallerie degli Uffizi in Florence. The traveling exhibition is also intended to support conservation of the Parish Church and the adjoining former Franciscan convent of San Michele Arcangelo. 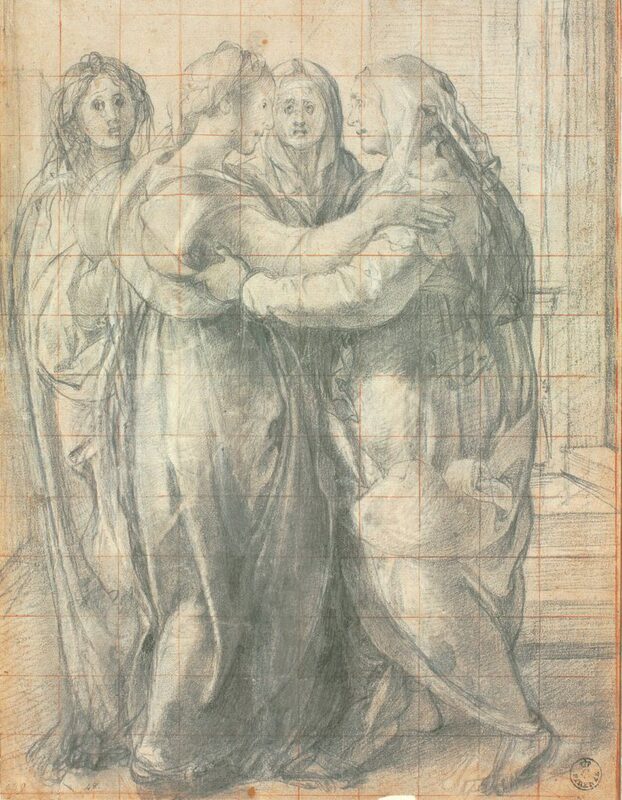 Study for Visitation, about 1528–29, Pontormo (Jacopo Carucci). Black chalk, traces of white chalk, squared with red chalk, 18 1/2 x 13 3/8 in. Gallerie degli Uffizi, Gabinetto dei Disegni e delle Stampe, Florence. Image © Roberto Palermo / Gabinetto Fotografico delle Gallerie degli Uffizi / Su concessione del Ministero per i Beni e le Attività Culturali e del Turismo. All rights reserved. As part of the scientific analysis prior to conservation, an infrared reflectogram was taken of the entire painting. 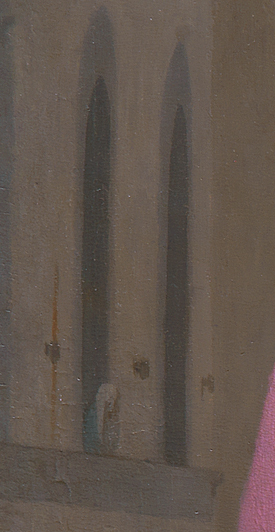 It shows that Pontormo replicated the red chalk grid marks in hismodello onto the gesso ground of the panel (the plaster placed on the wood as a base layer). This allowed him to enlarge his drawn composition by drawing free hand, square by square, onto the panel—which measures almost seven feet high by five feet wide (207 by 159 centimeters). Unlike other artists of his era, Pontormo did not use a cartoon, a full-scale drawing on paper, that could be traced or transferred directly onto the panel at 1:1 scale. “The precision of the underdrawing that you can see from the infrared reflectography is very typical of Florentine painting, as opposed to say, Venetian painting, where you would never see such precise drawing on a panel’s surface,” Gasparotto told me. The infrared reflectogram also revealed Pontormo’s pentimenti or second thoughts. Conservator Rossi points out that the feet of the attendant in the pink robe, for example, are shown frontally in the drawing. In the infrared reflectogram we see that the artist first turned them in a three-quarter view, and then placed them frontally. 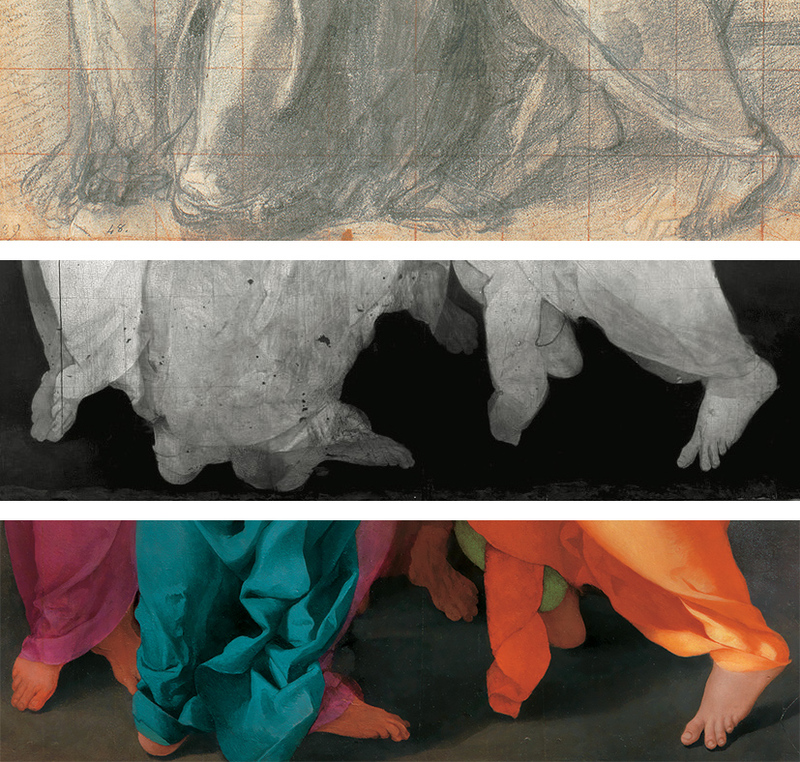 Visitation, Jacopo da Pontormo: detail of the young attendant’s face seen under IR reflectography (left), in the modello (middle), and in the original painting (right). The restoration of the Visitation further revealed details that had long been lost as a result of previous overpainting. 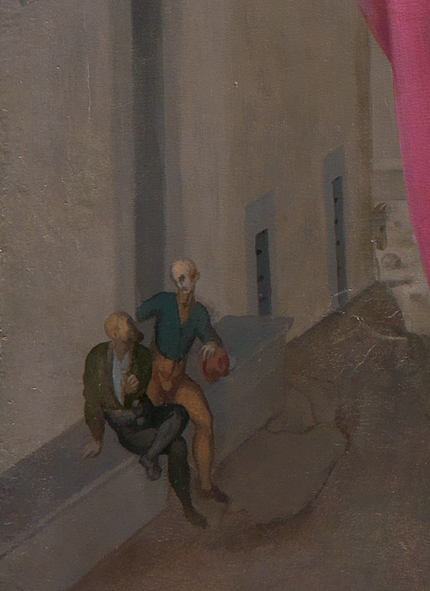 Visible now are tiny images of two men on a bench, a gray donkey peering from around the corner of a building, and a woman hanging laundry in the window. Taken together, the bright colors and evocative figures give the Visitation a modern, almost surreal quality. When Rossi invited video artist Bill Viola to his workshop in 2013 to view the Visitation, the artist exclaimed, “For me, this is contemporary art. It is all contemporary.” Indeed, the Visitation was the source of inspiration for Viola’s Greeting, as well as modern and contemporary art and popular culture, from Giorgio de Chirico to The Sopranos. 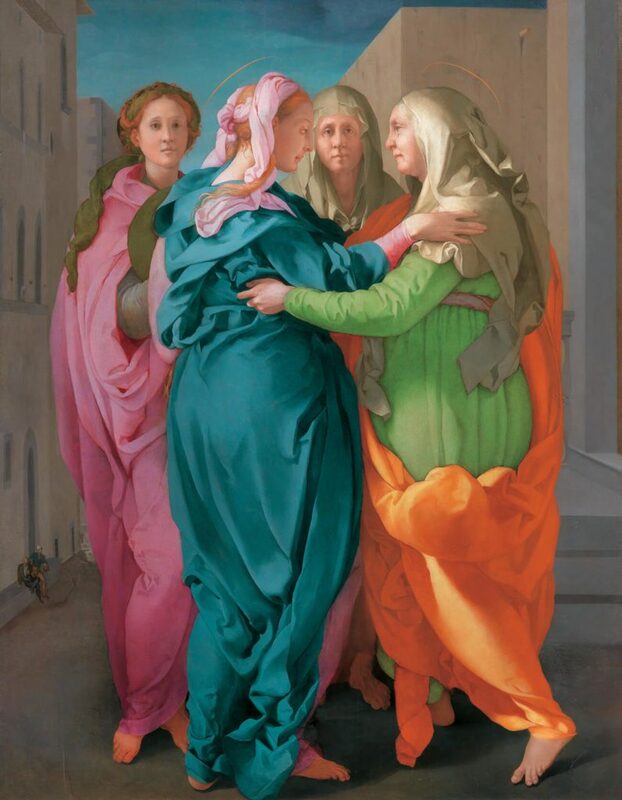 To learn more about the artist’s process and the conservation of the Visitation, see the exhibition catalogue, Miraculous Encounters: Pontormo from Drawing to Painting, published by Getty Publications. The exhibition is on view at the Getty Center from February 5 to April 28, 2019. Originally published by The Iris, 02.05.2019, under a Creative Commons Attribution 4.0 International license. This entry was posted in Uncategorized and tagged Art History, Painting, Pontormo, Renaissance. Bookmark the permalink.